Aston Martin has confirmed its plans of creating a new super saloon, inspired by the William Towns-designed 1976 Lagonda. The luxury car, bearing the Lagonda badging will be offered exclusively in the West Asian market. While the design will see a revival of the iconic Lagonda ethos, the car will be based on Aston Martin's current flexible VH architecture. The brand plans to incorporate modern automotive technology such as carbon fibre body panels into the super saloon. The limited series will be created at Aston Martin's Gaydon facility, which was previously the production site for the One-77 hypercar, and will be hand-crafted for a select clientele. We use the word 'select' because the car will be offered for sale "by invitation only" (their words, not ours). While Aston Martin will maintain confidentiality of the pricing details, the asking price will depend on the difference in quality, exclusivity and luxury value additions for each unit. On Aston Martin's decision to debut the car in West Asia, their design director Marek Reichman said that it "will be an exciting moment not only for Aston Martin, but for discerning customers who are seeking the ultimate in luxury and personalisation. The new model, like its exclusive siblings the One-77 and V12 Zagato, has been created as a piece of exceptional automotive art. It has been designed and developed entirely in keeping with the spirit and ethos of previous Lagonda super saloons  notably the William Towns Lagonda  and as a tribute to this car it proudly bears the Lagonda nameplate." - Exclusive super saloon sees return of evocative Lagonda nameplate - Innovative special project champions exclusivity - Strictly limited series production from early 2015 25 July 2014, Gaydon: Aston Martin is today confirming a bespoke product programme for a new super saloon that will see the revival of the historic Lagonda nameplate in a strictly limited series. As has traditionally been the case, the Lagonda badge will once again sit proudly on a luxurious and exclusive super saloon. The stunning luxury super saloon revives the Lagonda ethos of 'the finest of fast cars' and will be offered exclusively in the Middle East, as a result of specific market demand. The return of Lagonda follows in the wake of other headline-grabbing projects such as the One-77 hypercar, V12 Zagato and last year's CC100 Speedster Concept  then seen as the ultimate Q by Aston Martin car  which started out simply as a centenary celebration design concept and, as a result of exceptional demand, later turned into two customer commissions. Based on the brand's existing flexible VH architecture, the new car draws inspiration from the highly sought-after William Towns-designed Lagonda of 1976 and features many of the same cutting edge engineering techniques seen in modern Aston Martin sports cars such as the use of carbon fibre in the body panels. It will be hand-built by the finest craftsmen and women at Aston Martin's modern manufacturing facilities in Gaydon, Warwickshire in a dedicated building previously given over to the creation of the One-77 hypercar. The new super saloon will be offered for sale by invitation only and, while precise pricing details remain confidential, the asking price will be commensurate with the car's exclusivity, quality and luxurious nature. Aston Martin Design Director Marek Reichman said: "The debut of this luxury super saloon in the Middle East market will be an exciting moment not only for Aston Martin, but for discerning customers who are seeking the ultimate in luxury and personalisation. "The new model, like its exclusive siblings the One-77 and V12 Zagato, has been created as a piece of exceptional automotive art. 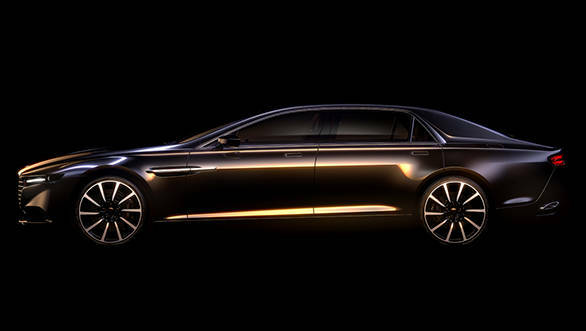 It has been designed and developed entirely in keeping with the spirit and ethos of previous Lagonda super saloons  notably the William Towns Lagonda  and as a tribute to this car it proudly bears the Lagonda nameplate."